"With a lightweight frame, race-inspired wheels, 18 gears, and clip-less pedals (swap in regular pedals for $20), the Giant FCR 1 W is a thoroughbred. The flat handlebar promotes an upright position, which means more traffic awareness and less back strain. $1,025, giantforwomen.com"
We have the FCR 1 W's more economical little sisters in stock, the FCR 2 W ($849.99), and the FCR 3 W ($549.99), but if you'd prefer the top-of-the-line FCR 1 W, we'd be glad to special-order it for you (our price is actually $949.99)! 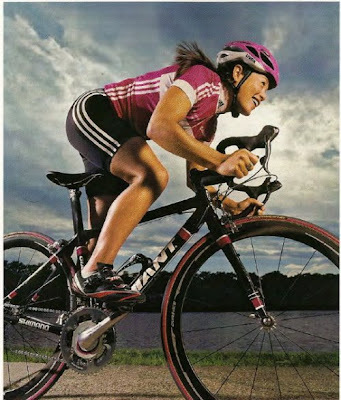 The accompanying article also contains tips on cycling as a great fat-burning activity, and features a photo of Giant for Women Ride Society Leader Mari Holden riding the Giant TCR Advanced T-Mobile bike. You can download a PDF of the whole article here. There ya go. me likey!